We print all our items on demand. We strive to ship within 72 business hours, however larger orders may take up to 4-5 business days. Transit time varies by location and selected ship method. How do I assemble my cardboard standup? If you have a double easel standup see the video HERE. You can find more instruction videos on our Youtube Chanel HERE. Does Advanced Graphics ship to PO/APO boxes? No, we cannot ship to PO Boxes. We also cannot ship to APO/FPO Boxes to overseas locations outside of the US. How will my cardboard standup be shipped and packaged? All items are shipped via FedEx. They arrive folded in thirds and packed in large cardboard envelopes. Each cardboard standup will have a surrounding shell to protect the edges during shipping. 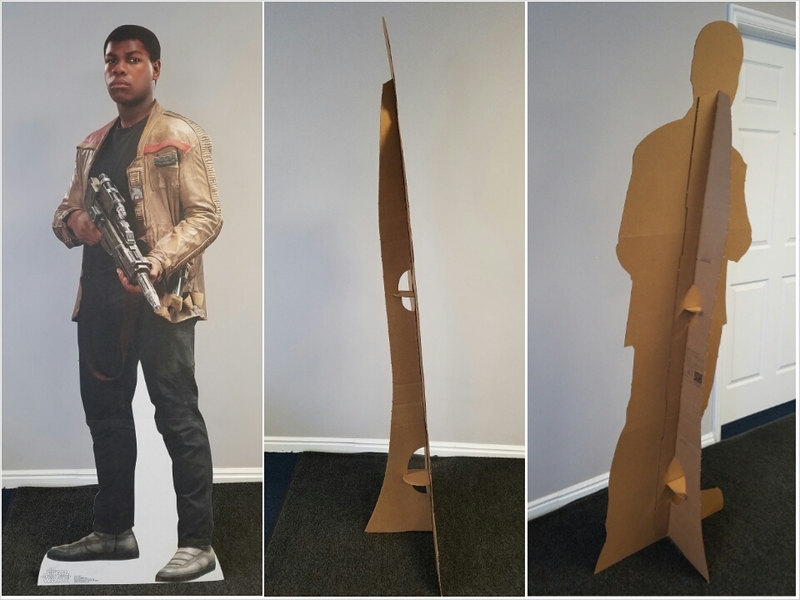 You can view a video of one of our customers opening their cardboard standup HERE. Does Advanced Graphics ship internationally? Yes, however some of our items are not permitted outside of the US. Please contact us for more information regarding international shipping and ordering. How do I become a reseller for Advanced Graphics? If you are a business and would like to offer our products for resell, please contact us at info@advancedgraphics.com for more information. Can my cardboard standup stand on its own? Yes, each standup comes with an easel on the back so it is free standing. Can you make a cardboard standup of a character or celebrity that I don't see on your website? We do offer custom cardboard standups, however it needs to be an image you own or have rights to. If you are looking for something generic we are happy to find an image for you. We cannot make cardboard standups of licensed characters (celebrity, cartoon, logo, athlete, etc), unless you are able to provide us with proof of usage rights through official documentation. These rights are not something we are able to obtain for you. Feel free to contact us with any questions regarding this or you can order/read more about this on our custom site HERE. Can I have a custom cardboard standup made from my own picture? Absolutely! Custom cardboard standups can be made from any picture you own the rights to. You can order and read more about this process on our custom site HERE. Feel free to contact us if you have any questions. Where can I download the software to upload my own sound to my custom voice box? 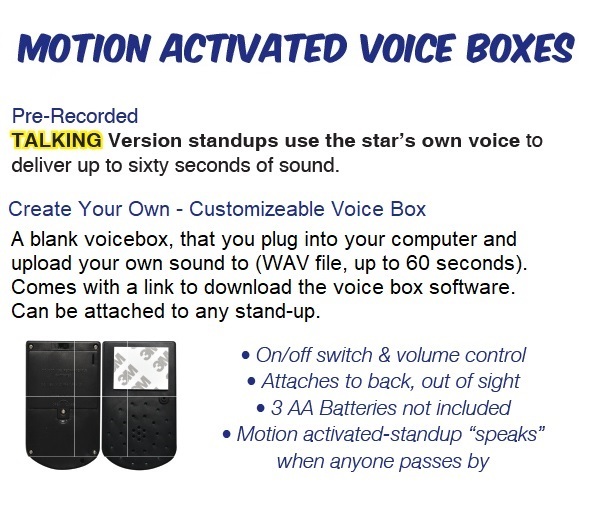 Click the link below to download our voice box software. Note: This is a third party software program that we did not create. However we can help as needed with any problems to the best of our knowledge. The ZIP files contain EXE and DLL files which your virus scanner may pickup up as a potential virus. We have verified this software to not be a virus. If your computer brings up this error it is a false positive. How are Advanced Graphics cardboard standups made? Where are Advanced Graphics cardboard standups manufactured? Our cardboard standups are all manufactured by us in Layton, Utah. Made in the USA! Can I have a cardboard standup printed on a different material? Yes and no; custom orders or generic items can be printed on alternative materials. Images of licensed characters cannot be altered in any way or printed on different materials. Additional fees may apply. Please contact us if you have further questions. What materials can Advanced Graphics print on? We offer custom printing on the following: cardboard, foamcore, corrugated plastic, styrene, vinyl banners, vinyl stickers, removable vinyl wall decals, wood, various points of C1S and more. How do I receive a quote for a custom standup or print job? Didn't see an answer to your question? Click HERE to contact us and we'll be happy to help you!